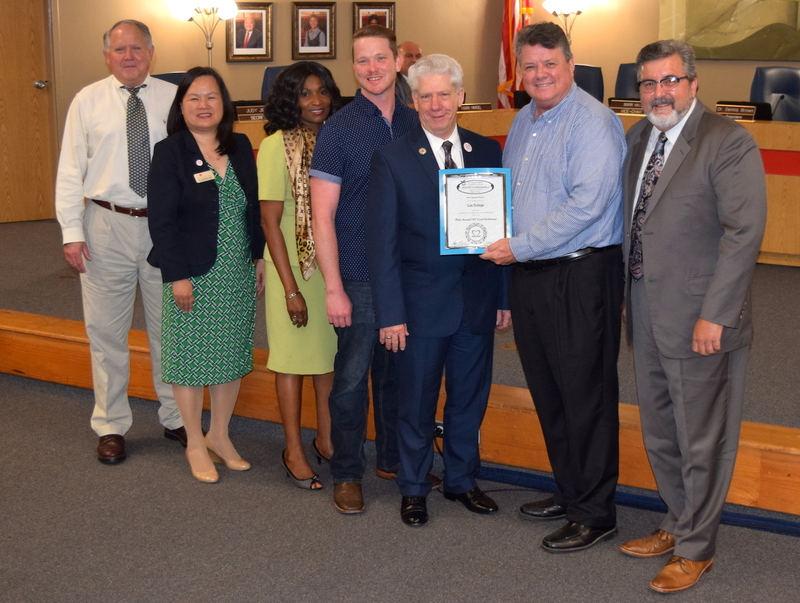 Baytown Mayor Stephen DonCarlos (center) presents a proclamation naming July 13, 2017, as Summer Learning Day to Lee College administrators and faculty at city hall. The college is partnering with Academic Beginnings for Children for Summer Learning Day to raise awareness of the importance of keeping kids learning, safe and healthy over the summer so they can return to school in the fall ready to succeed. 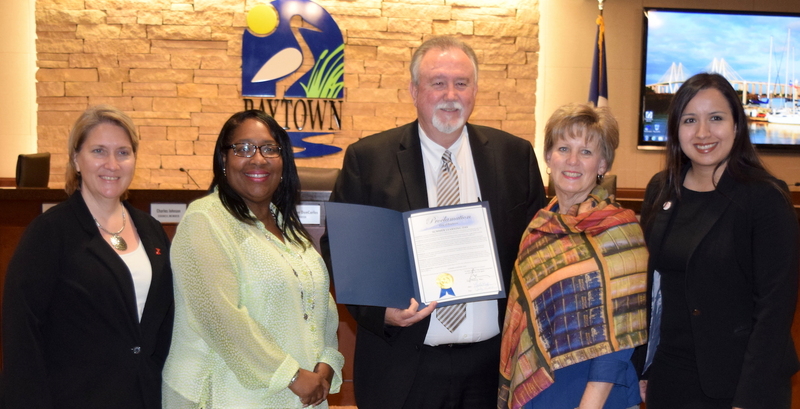 Also pictured, from left: DeDe Griffith, Director of Access and Student Success; Treva Brown-Askey, chairwoman of the Developmental Education Division; Donna Mohlman, Special Projects Librarian and co-chairwoman of Academic Beginnings for Children; and Dr. Christina Ponce, Executive Vice President and member of the Kiwanis Club of Baytown. BAYTOWN, TX — Lee College is working in the community to help local youth beat the damaging “summer slide”: the phenomenon where young people, often low-income, lose academic skills during summer vacation and fall behind their peers by the time the new school year begins. The college is participating in National Summer Learning Day on July 13 in partnership with Academic Beginnings for Children (ABC), a broad-based coalition of education, civic, business and non-profit organizations working together to deliver the best solutions for children. The annual event is sponsored by the National Summer Learning Association (NSLA) to raise awareness of the importance of keeping kids learning, safe and healthy over the summer to ensure they return to school in the fall ready to succeed. On Summer Learning Day, the Lee College Mobile Go Center will be posted at Roseland Park in Baytown from 10-11 a.m., and the Stratford Branch Library in Highlands from 2-4 p.m. Students and families who climb aboard the center — a 42-foot, air-conditioned trailer equipped with high-speed Internet and other state-of-the-art technology — can enjoy e-books provided through a grant from the Delta Kappa Gamma Educational Foundation, and receive information about preparing for college. Children can also take a free paperback book home with them to read this summer, thanks to a $400 donation from the Kiwanis Club of Baytown, and participate in arts and crafts and other activities. The Mobile Go Center will also be on hand throughout July and August at select locations where the Goose Creek Consolidated Independent School District (GCCISD) serves free breakfast and lunch to children 1-18 years old. In addition to losing access to nutritious meals, the NSLA estimates that low-income youth lose two to three months in reading and math skills over the summer while their higher-income classmates tend to make slight gains. By fifth grade, those reading and math losses can leave low-income students two to three years behind their peers in school. For more information about National Summer Learning Day, ABC programs in the community or other summer meals events, contact Mohlman at dmmohlman@gmail.com. 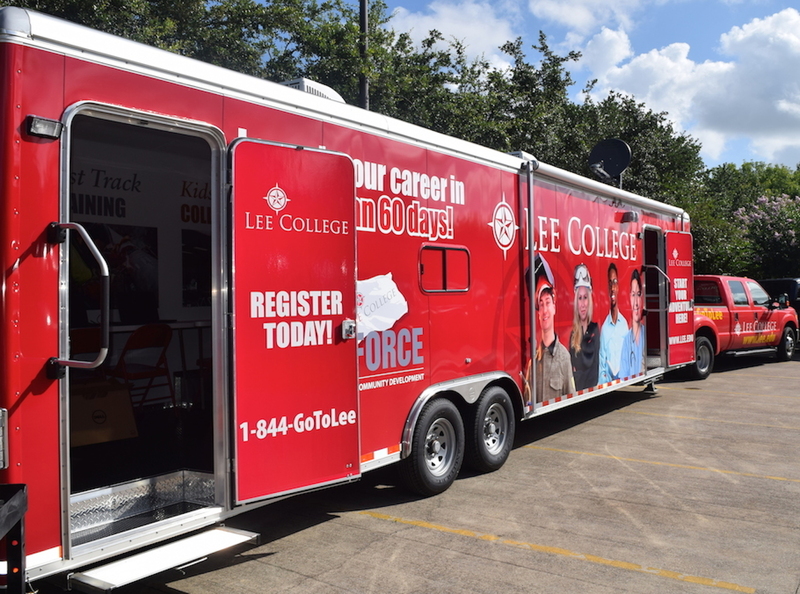 To learn more about the Lee College Mobile Go Center, which is available to come to various venues to assist potential students with higher education and workforce activities, visit www.lee.edu/bearebel. Philadelphia native Rob Coles was just 7 years old when he first picked up a tennis racket, embarking on what would become a 30-year career as a tennis player, coach and instructor at private clubs and community organizations across the country. Now Coles is bringing his talent and passion for the sport he loves to Lee College as the new tennis professional, directing a revamped youth tennis program that kicked off this fall. The tennis program will include private and group lessons for children aged 4-18 years, with an emphasis on helping students develop strong hand-eye coordination and proper footwork and movement. There will also be opportunities for free match play, junior team tennis and in-house competitions. Coles was initially drawn to tennis because of his intense competitive spirit. After playing and coaching extensively from Pennsylvania to California and many states in between, he saw how the sport gave young people more than just the motivation to be their best. Through tennis, they also learn the value of hard work, patience and taking the time to think things through, he said. For more information about the youth tennis program at Lee College, contact Coles at 281.425.6843 or rcoles@lee.edu.